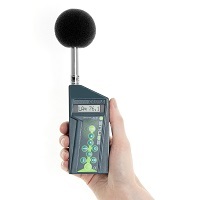 Sound meter kits and training courses designed for the Control of Noise at Work Regulations 2005 and similar international noise at work legislation. The Control of Noise at Work Regulations 2005 came into effect in April 2006 and are designed to protect workers against risk to their health arising from exposure to noise at work. A range of sound meters are available from us which can be used to measure sound levels and monitor a worker’s exposure to excessive noise levels in the workplace. We also run a free seminar which covers the requirements of the Control of Noise at Work Regulations 2005 and a training course covering the aspects of sound level measurement, usage of meters and understanding the results. Our sound level meter kits range from simple sound level meters for spot checks and basic monitoring to sound meter kits for long term noise monitoring and include dosemeters to measure sound exposure and noise activated systems to help warn about excessive noise. Legislation in Australia and European countries closely follows the Control of Noise at Work Regulations, with similar noise action levels. Our sound meters are designed to be setup in accordance with measurement levels relating to noise at work legislation so dosemeters and sound meters measuring exposure levels can be assigned specific exchange and criterion levels while noise warning signs can have a specific set level for activation. If you are unsure of which meter is right for you or want help in where to start with noise measurements then contact us today. We can advise on the right training and meters for your application or, if the job seems too daunting, we can provide a consultancy for your company. 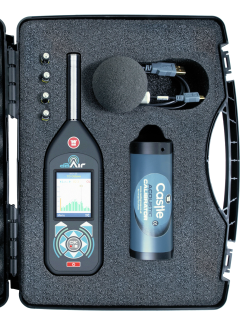 Two basic kits can be used for noise level tests without the need for full compliance. These kits give an indication of noise levels and can be used for spot checks. Noise meter kits which feature the Class 1 SONUS sound meters, ideal for checking noise levels in small to medium companies. SONUS dosemeter kits, designed for measuring personal noise exposure. dBAir Sound Meter systems combine WiFi with everything else you’d expect in a high end Sound Meter, at a fantastic price. 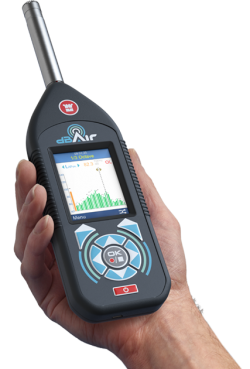 dBAir Safety Managers System Designed specifically for Safety managers, comprising everything you require to carry out assessments to the Control of Noise at Work Regulations 2005, as well as being the ideal system for International Occupational Health Monitoring. NK002 Risk Assessment System with a choice of Class 1 GA6224 or Class 2 GA6226 logging sound level meter with calibrator, analysis software and case. Logging and advanced sound meter kits for large companies, professionals and consultants working in health and safety. Kits feature sound level meters with real-time octave band analysis and WiFi data output to TheCastleCloud.com cloud software. All kits come with calibrator and rugged case to house all the instruments. NK103 dBAir Safety Managers System with Octave Band Analysis includes Class 1 dBAir 1/3 Octave Band Analysis Meter and Class 1 Calibrator GA607. NK114CONS dBAir Consultants Assessment System with 1/1 and 1/3 Octaves includes the dBAir Safety & Environmental Octave Meter and the GA607 Class 1 Acoustic Calibrator. A valuable tool to measure personal noise exposure, the dosemeters come in two styles, logging dosemeters and non-logging dosemeters. Each kit is available to buy now with either a single dosemeter or kit of 5 dosemeters. The GA902 Noise Activated Warning System is a warning sign that only lights up when noise levels raise above a set level (ideal for the limits set in the Control of Noise at Work legislation) giving a clear indication that hearing protection must be worn. Alternatively for pubs, clubs and entertainment venues there is a Music Too Loud sign. The GA907 dBAlert is a small personal noise switch which will give the wearer a clear indication when noise levels are high and hearing protection must be worn.